TIMELINE | How will Hurricane Michael affect Georgia? Inland tropical weather watches have already been issued for portions of south Georgia in advance of Michael. Hurricane Michael made landfall Wednesday afternoon as a category 4 storm near Mexico Beach, Florida. The last major hurricane to make landfall along the Gulf Coast was Hurricane Irma last year. Inland tropical weather watches have been issued for most of Georgia south of a Warrenton-to-Macon-to-Columbus line in advance of Michael. Heavy rains could cause flash flooding and severe weather, with vivid lightning and gusty winds. 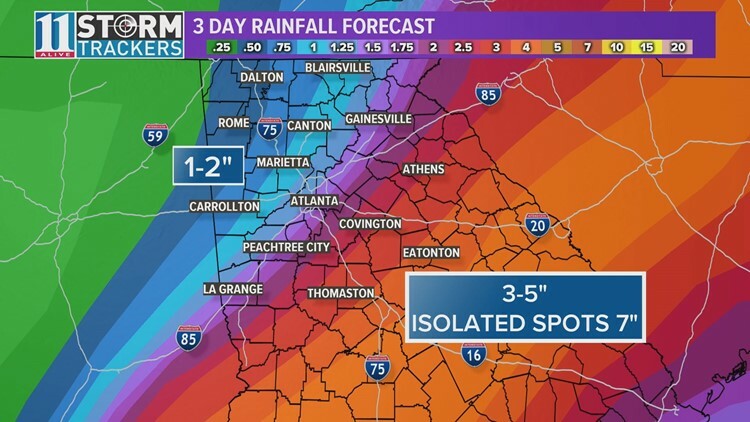 This could lead to falling trees and power loss over much of Georgia. Gov. Nathan Deal declared a State of Emergency for 108 Georgia counties. Florida's Gov. Rick Scott issued a state of emergency late Sunday in advance of Hurricane Michael for the counties in the Florida Panhandle and Big Bend region. GEMA officials released a statement early Monday afternoon in advance of Michael's arrival. The Georgia Emergency Management and Homeland Security Agency is actively monitoring what has recently developed into Hurricane Michael. We are working closely and coordinating with our local, state and federal partners in anticipation of the storm’s potential impacts. Now is the time to review emergency plans and pay close attention to local updates. Michael moved northeastward across the Florida panhandle into southern Georgia. Heavy rainfall amounts and gusty winds are expected across much of the state. Strong winds are possible in parts of metro Atlanta. In addition, brief, isolated tornadoes are possible south and east of metro Atlanta as Michael traverses the state. Michael's strength decreased quickly over land. The storm will continue to move toward the northeast over the Carolinas and parts of Virginia before heading out over the Atlantic Ocean as a tropical storm by late Thursday or Friday. Heavy rains are likely across parts of the state with total rainfall amounts varying, depending on the exact path Michael takes.